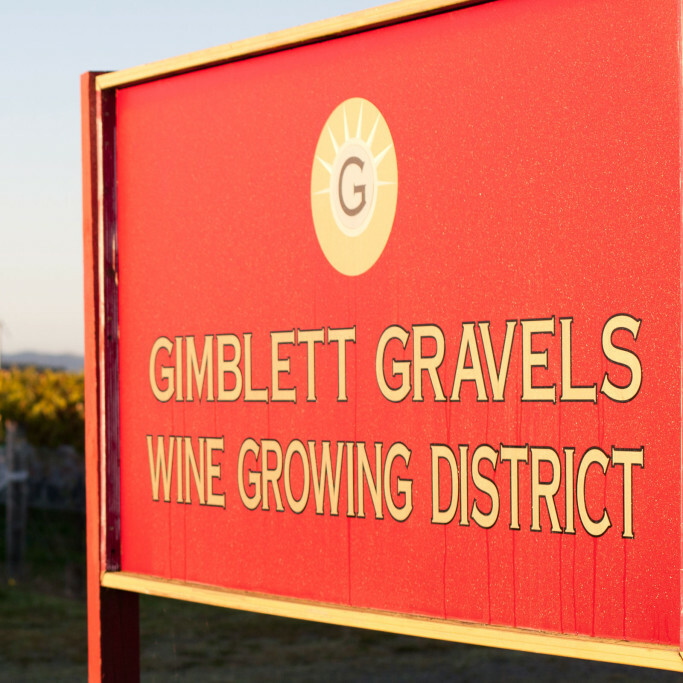 Learn more about the GIMBLETT GRAVELS. To watch the video below, click on the Play button. 90% of the land is planted in red grape varieties – 35% Merlot, 20% Syrah, 15% Cabernet Sauvignon, 7% Malbec, 4% Cabernet Franc and small pockets of ‘Other Red’ varietals, including Grenache, Montepulciano and Tempranillo. The remaining 10% is planted in Chardonnay, Viognier and very small pockets of other aromatic varietals, including Arneis, Gewurztraminer and Riesling. The first Syrah was planted in 1982 by Alan Limmer of Stonecroft. 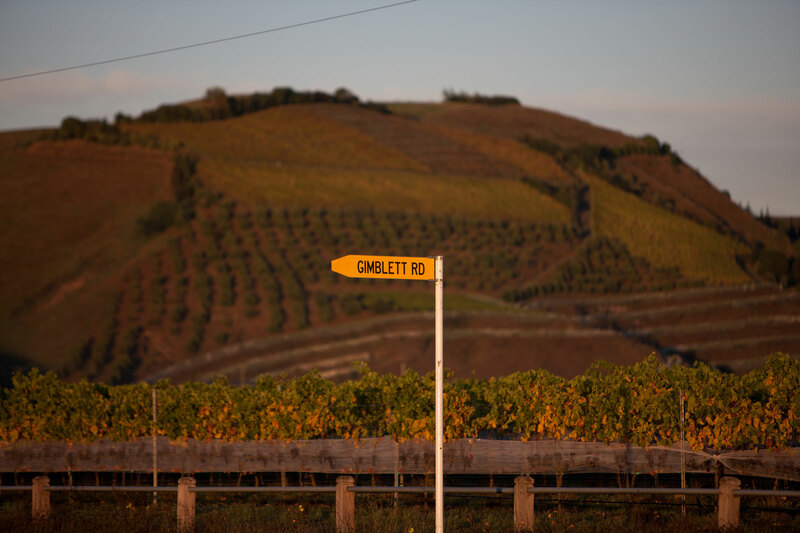 Viticulturally the GIMBLETT GRAVELS WINE GROWING DISTRICT has an extremely short history. Up until the late 1980’s the area was regarded as the poorest, least productive land in Hawke’s Bay, needing about three acres to feed one sheep and no hope of growing a decent crop of anything. Town planners allowed drag strips, warehouses, coolstores and in fact whole suburbs to be developed in the district as it was the best use for the land. A concrete company purchased 150ha. to mine for gravel. You couldn’t give the land away. The first vineyards were planted in Mere Road in the late 1970’s with Chenin Blanc and Muller Thurgau, some time before the first Bordeaux red varieties were planted. While somewhat undistinguished varieties, they ripened earlier at higher sugar levels than any other locality, and probably pointed our pioneering vignerons in the right direction. Chris Pask, who owned an aerial top dressing business, used to fly over this dry barren wasteland everyday. He had a few vineyards on more fertile land elsewhere in Hawke’s Bay but could never fully ripen the Cabernet Sauvignon he had growing there. So, in 1981, he took a punt, risked ridicule from his mates and purchased a 40ha. block at the end of Gimblett Road. Around the same time David Irving and Gavin Yortt, and John Kenderdine also developed vineyards along Gimblett Road. The first plantings were of white varieties with the first red grapes, comprising Cabernet Sauvignon, Cabernet Franc and Merlot, planted in this area late 1981. In 1982 Dr Alan Limmer, a noted soil chemist, established Stonecroft vineyard on the stonier soils of Mere Road. Initially, he planted Cabernet Sauvignon and a single row of Syrah vines that he had rescued from the viticultural research vine collection at Te Kauwhata research station. At that time, these were the only Syrah vines in New Zealand, having been originally imported from Australia as part of a research programme. But for Alan’s intervention, they were scheduled to be destroyed consequent upon a restructuring of the research station. At that time, Stonecroft’s neighbours included a landfill, a gravel quarry and an army firing range! Alan Limmer then applied to the local council for consent to construct a winery but this was initially rejected. Fortunately this decision was overturned on appeal. Although able to produce their own wine after the winery was approved, Alan then embarked on a lengthy process persuading the local council that the area should be zoned for viticulture. What ensued involved a protracted legal battle with Fraser Shingle, a local company intent on quarrying the same gravel in the area for concrete. Litigation continued for almost a decade and, whilst other vignerons became involved in support of the viticultural cause, during that time Stonecroft remained the only winery in the vicinity. It wasn’t until 1992 that the legal battle was finally won, enabling further investment in wine industry activities in the area to follow. The first red wine blend from Bordeaux varietals was released by CJ Pask in 1985. This wine, and the 1986 vintage, won wide acclaim, topping wine shows and tastings all over the country and really set the benchmark for the start of the district’s fame. His mates decided that Chris Pask wasn’t an idiot! The real planting boom didn’t take off until the early 1990’s when companies such as Babich, Delegat’s and Villa Maria, who up till then, had sourced grapes from growers vineyards, began purchasing land and developing vineyards in the most stony soils of the district. Land became a premium as these new vineyards enhanced the growing reputation of the district for Bordeaux red varietals and the stony soils quickly got snapped up by existing players and new companies alike. In the face of mounting opposition, the concrete company gave up their battle to mine their piece for gravel, and sold it. In the mid 1990s, a group of vineyard owners formed the Gimblett Road society, its principal aim to protect and develop the reputation of this special area. This soon broadened out to other growers in the vicinity and the term GIMBLETT GRAVELS was adopted. In January 2001, the GIMBLETT GRAVELS Wine Growers Association was officially launched to the wine world. There are now some 800 hectares of vineyards showing the unique terrain of the GIMBLETT GRAVELS WINE GROWING DISTRICT. William John Gimblett, (my grandfather), was born in Tavistock, Devon on the 12th March 1872. In 1878, along with his family, he was among 256 immigrants on board the “”City of Auckland”’ when it ran aground at Otaki around 9.00 – 9.30pm on the 22nd October. In a southwesterly gale and poor visibility as they prepared to enter Cook Straight, Kapiti Island had been mistaken for Staphens Island 14 to 15 miles further south. The ‘Hinemoa’ was sent from Wellington and my grandfather’s parents along with other immigrants walked the nearly 12miles to Waikanae. Some were taken by bullock drawn carts – perhaps my then 6yr old grandfather was one of the lucky ones. The ‘Hinemoa’ went first to Wellington and then to Napier where the family settled at Petane. With perfect handwriting my grandfather’s first job was for a lawyer where he wrote the important documents and addressed the mail. He left to carry a butcher’s basket over the Napier hills with a huge weekly pay increase and went on to become a butcher. In 1898 he married Amy Bertha Crawford who was born in Havelock North and in 1902 became studmaster for Nelson Bros of Tomoana, who that year had founded a Southdown sheep stud with sheep imported from England In 1904 while employed by Nelson Bros he purchased the land that we always referred to as ”the riverbed” and of course now forms a large part of the ”GIMBLETT GRAVELS WINE GROWING DISTRICT”. He purchased it at just under four pounds an acre from William Nelson’s son in law. Each year the works were opened when the ”Gimblett lambs” were ready as they matured more quickly and thought to be because the temperature was about 2 to 3 degrees warmer than the other lamb producing areas. He died on the 4th July 1944.